At Emerald Wellness and Bodywork we are passionate about educating our clients. Each massage is customized to address your overall fitness and wellness goals. Best Massage in Boise. Deep tissue massage uses firm pressure and slow focused strokes to reach deeper layers of muscle tissue. Deep tissue massage is best for clients with chronic body aches and pain. If you have a stiff neck, shoulder tension, or chronic back pain deep tissue massage can help give you relief. Deep tissue is used to break up scar tissue and to physically break down knots and adhesions. Sports massage therapy is customized for athletes of every kind, from world-class professionals to weekend joggers. The particulars of the sports massage technique are specific to the athlete’s sport of choice. Focusing on areas of the body that are overused and stressed from repetitive and often aggressive movements. Pregnancy is a time in a woman’s life in which she should truly listen to her body, and be fully focused on taking care of her health. You are now a mother and taking care of your body is is the greatest gift you can give the tiny life growing inside of you. Massage is an easy way to keep the body healthy during pregnancy. What kind of massage do you need when you’re pregnant? At Emerald Wellness & Bodywork we specialize in prenatal massage. BOISE MASSAGE- We are a client-centered massage establishment offering therapeutic, medical massage at affordable prices. We believe massage therapy (human touch) is an essential component of healthy living. We look at the body with a holistic whole body approach. We are dedicated to healing the mind, body, and spirit. We do not just massage our clients we treat them like family. We believe you must be educated about your body. Education is empowering, we will teach you about what we find in your body so you may improve your health in your day to day life. Science has confirmed numerous times what your body already knows. Massage is healthy, and it feels good. The right massage treatment can lead to big physical benefits, including lower blood pressure, better sleep, and a stronger immune system. Our customized massage therapy will help our clients maintain a healthy body. Our team of licensed massage therapists provide a variety of treatments and modalities to help relieve a body from injury or chronic pain. We believe regular massage therapy is a prevention for potential injuries. We provide massage therapy treatments to help alleviate mental health issues, and those suffering from chronic depression and addictions. The science of massage and the healing benefits of human touch is fascinating. If you learn to put your health first you will find a balance in your life. Our goal is to match each client’s needs with the right type of services in order to obtain the greatest benefits from massage therapy and our company. Our products are of the highest grade, pure, natural and organic. The skin is the largest organ and using the bests products is our commitment to our patients. Our company is very clean as we pride ourselves in a sterile, clean environment. As a locally owned business, we are committed to our clients, and follow the GOLDEN RULE with our business practices. Taking care of your physical and mental health is a process and your health should not be taken for granted. A tortoise moves slow and steady yet never giving up on the end result. Our company BELIEVES in your overall well-being. Exceptional staff, facility, and massage rooms. Locally owned. Reasonable prices and great holiday sales! I’m a retired professional contemporary dancer, and used to receive many forms of massage on a regular basis. I have never had a massage as good as the ones I have received from Emerald Wellness and Bodywork. Hands down-they have the best crew! 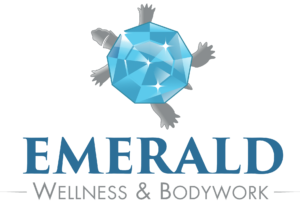 I recently went to Emerald Wellness seeking a sports massage, as I’m a nurse and fitness instructor. I really like Anna’s massages. She did a sports massage and even used the hot stones. She is amazing. I also highly recommend Carmen. She is absolutely incredible-she can do it all, energy work, sports Massage, hot/cold stone. Great massage and great staff, very professional. I loved my CBD MASSAGE it really helped me to sleep without pain. I tried the CBD Infused Massage and could feel the difference within an hour after my session. I have had chronic shoulder pain for quite some time. I got an MRI and found I have 2 torn ligaments. I have been trying to avoid surgery by getting massage therapy. I could not put my arm behind my back and removing clothing was difficult. After my massage, I was kinda shocked I could not feel the throbbing, annoying pain as much it was still there but dull. I since have been in for a total of 3 times and I can fully put my arm behind my back and have a full range of motion as well as no pain. My therapist was very knowledgeable and explained to me why the CBD Massage was worth a try. The product does not have any THC. Thank you Laura for fixing me! I can honestly say that Emerald Wellness & Body work was the best experience I have had at a massage parlor. The staff was great, and very welcoming. They make you feel comfortable, and allow you to choose the type of massage you want. Great experience. I had Dani as my massage therapist and she was amazing!! She was friendly, kind, and definitely good with her hands. I recommend giving her a try 🙂 ! Thx Emerald. I am very happy with the care I receive here. The owner is very knowledgeable about bodywork and goes above and beyond to make sure your visit is the best it can be. I feel they listen to your needs and make valuable suggestions for your treatment in order to feel amazing when you walk out of there. Lindsay is an amazing massage therapist. The place is clean and everyone there is friendly. Often times I can get an appointment the same day I schedule. I highly recommend Emerald Wellness & Bodywork. It is the only place I will get massages. Absolutely Amazing Experience! I had the best massage ever! My pain is now gone and I feel so much better! They take HSA payments, which makes it even better! I highly recommend this business! I have been getting massages for 30 years now and have had some incredible therapist. Emerald Wellness & Bodywork has some of the best!! They are extremely knowledgeable, very professional and work very hard to accommodate you schedule. I can’t say enough about this business, they are incredible! As a courtesy to our therapists, please notify us 24 hours in advance if you need to cancel your appointment. Without proper notice a cancellation fee may be incurred as we guarantee that time for you. Please note, gift cards are non-refundable. All sales are final.